A-Cute Derm® offers more than 100 products meeting a variety of cosmetic and health-related needs, including the pioneer line of Emu Oil with its skin healing properties. 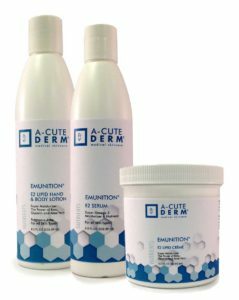 All A-Cute Derm® products are patient-tested and utilize pharmaceutical-grade (highly purified) ingredients, thereby offering the highest efficacy available in products today. Arguably, the most recommended products are the Pro-Tect® Sunscreens and the Emunition E2 products (Serum and Lipid Crème). The Pro-Tect® Sunscreens are made using the A-Cute Derm Pro-Spectrum™ process which offers the best possible absorption spectrum available. Most sunscreens only absorb a very small amount of UVA since the FDA only considers UVB when assigning SPF values; but the Pro-Spectrum™ process was designed to give Pro-Tect® sunscreens the best absorption possible. In fact, there is no other sunscreen in the world that will give you the same protection as Pro-Tect™ sunscreens. They are also fragrance free and greaseless. Emunition E2 Serum is 95% emu oil and 5% vitamin E. This combination penetrates the skin making it a fantastic healing product for everything from extremely dry, parched skin to radiation burns. It is the greatest serum to apply after hair removal. For the client/patient needing a moisturizer for under make-up, the Emunition E2 Lipid Crème (20% emu oil) is also healing while penetrating and moisturizing. An antioxidant to assist in the repair of sun damaged skin. Topical treatment scientifically known to fight inflammation. Enhances the performance of vitamins and antioxidants in the skin, especially Vitamin C.
Gives 20% concentration of essential Vitamin C.
Provides more Vitamin C than normal healthy skin typically contains. Need very little product to see results. To be used sparingly on the face, around the eyes, the delicate neck and lip line areas. Les is more! Dramatically more effective than straight water-or-lipid soluble Vitamin C.
May be used with exfoliators such as Glycolic Acid and Retinol-based products. May be used while pregnant. Non -comedogenic, fragrance-free and non-toxic. "My husband and I participate in Agility dog sports throughout the year, so we’re exposed to the sun year round and need a sunscreen that provides strong reliable protection. We’ve been using Acute Derm Pro-Tect SPF-20 Sunscreen for about ten years. It is non-greasy, fragrance free, feels and goes on like face cream and lasts all day long. You can be out in the sun all day without a trace of redness; nothing gets through! This sunscreen is amazing! In the past, we’ve tried other products only to find they are oily or greasy and not as effective. Acute Derm Pro-Tech SPF-20 is the only product that we’ve found that provides reliable protection from the sun. We will not use any other product. Acute Derm Pro-Tech SPF 20-20 is the best!"